Texas Hold’em is by far the most popular poker game in the world today, and more hands of real money Texas Hold’em are played than any other poker variation. The reasons for this are many, however the fact is that this variety of the games is easier to understand and it provides a fast playing environment. It is of course the poker variation that is played in the World Series of Poker Main Event, as well as all WSOP Circuit Main Events and this means that Texas Hold’em poker gets a whole lot of media coverage. As far as playing real money Texas Hold’em online is concerned, there is a huge domino effect with regards to popularity. Players need other players to play, and as most of those players already in the poker room will be playing at the Texas Hold’em tables, then new players will inevitably head there. As they do, so the number at the Texas Hold’em tables grow, adding further to its popularity and dominance. Most poker TV shows that you see will also feature the Hold’em game and although Stud, Omaha and other variations provide plenty of entertainment, Texas Hold’em reigns supreme. Before any dealing is done, one player at the table is given the button. Think of the button as the player dealing, and of course when playing online the cards are dealt automatically, there needs to be a button to determine who posts blinds. The player to the immediate left of the button will post the small blind, and the player to their left will need to post the big blind in order to be dealt into the game. Once that’s done, the initial cards are dealt. 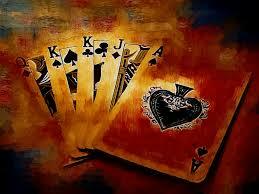 All players in the hand will be dealt 2 cards, and these are known as pocket cards or hole cards. They are dealt face down meaning that only the player who has been dealt them can see them. There is then a first round of betting which starts with the player to the left of the big blind. This player has the options to either fold or bet. Should they fold their cards they are out of the hand, and quite simply, if they bet (which must be a minimum of the big blind) they stay in the hand. The play continues round the table with each player having to either fold, bet or raise. Should a player at anytime raise the bet, then all players will need to match that bet to stay in the hand. Once the first betting round has been completed the flop is dealt. The flop consists of 3 cards, the first 3 cards of the community cards, and they are dealt face up for all to see, and all players to use. There then follows another betting round, where again players have the choice of folding, calling the bet or raising the bet. After this betting round, a fourth card is dealt, and this is known as the turn card. There will then be another betting round and the same options are available to all players that remain in the hand. Lastly the river is dealt. The river is the 5th and final community card that is dealt and it completes what is known at ‘the board’ i.e all community cards. The river card can and often does, make hands or breaks them and many a pot has been won and lost on the river. The final betting round takes place and remaining players may bet and raise, and should two or more players be remaining after the final betting round then we have a showdown. A showdown is where players that remain in the hand turn over their pocket cards and the winner is declared. The highest hand in standard poker hand rankings will take the pot with there occasionally being a split pot when 2 players have exactly the same hand. The highest ranking hand in Texas Hold’em poker is a royal flush, and there are a total of 10 possible hands that may be made, and you will find those in the chart below.